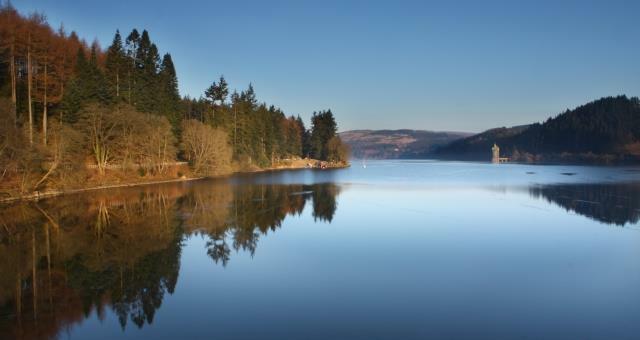 Nature Trails at Lake Vyrnwy / Llyn Efyrnwy01691 870278work Nature TrailRhiwagor Trail (2 miles, 3.2 km) with some parts suitable for wheelchair/pushchair. Llechwedd-du Walk (5.5 miles, 9.1 km, if walked as a circular route). Ty Uchaf Walk (5 miles, 7.8 km, if walked as a circular route). Craig Garth Bwlch Trail (3 miles, 4.8 km). Rhiwagor Trail (2 miles, 3.2 km) with some parts suitable for wheelchair/pushchair. Grwn Oer Trail (1-2 miles, 3.2 km). Reserve open at all times. Shop open weekends only Jan to end of March. By Car: From Llanfyllin, take the B4393 to Llanwddyn. Continue along the B4393 to Llanwddyn by taking a right turn. At the dam, turn left, then left at the end of the dam. The RSPB visitor centre is on the right.